“My family and I stayed in a Family Time Vacation Rental in Brian Head while on a skiing trip, and this guide made our planning so easy! Anyone looking to visit Southern Utah should use it to find great hiking trails and restaurants in the area. 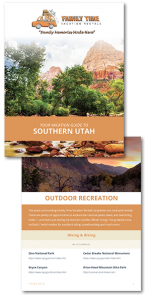 If you are planning a visit to the majestic region of Southern Utah, Southern Utah Vacation Guideonsider downloading our free Travel Guide! With an expansive list of area activities for all ages and skill levels, Southern Utah has become a destination for visitors from around the globe!